Nick Spencer likes big stories. He is the master of the long game as shown in Secret Avengers and his creator owned Morning Glories. But then someone had to go and give him the keys to the Avengers! Avengers World: Ascension continues to build three seemingly unconnected stories. First, an Avengers team on Barbuda/A.I.M. Island has been apprehended and Smasher has been turned into an A.I.M. henchman. A.I.M. Island, come for the villains stay for the waffles! Agent Hill reveals the secret to the sudden A.I.M. expansion and to cut off their pipeline to advanced technology, Sunspot and Cannonball will have to channel Marty McFly. The duo will bump into a team of unfamiliar familiar faces while challenging A.I.M.’s power source. Second, Falcon seeks his fallen teammate as Madripoor becomes a flying island on the back of a dragon. While Falcon searches for Shang-Chi, he uncovers an agency hinted at in Secret Avengers. Oh, and is that a group of Avengers? And finally beneath Italy a team of Avengers fights Morgan le Fay in the City of the Dead. They are joined by Euroforce, an Avengers like team lead by an old friend. In an interlude, Hyperion reflects on his purpose to be a hero or a teacher. A lot of this volume feels like Spencer is attempting to finish stories he wanted to tell in Secret Avengers. There are at least three references to his work in that title. One is a big reveal which feels like an attempt to explain why Black Widow, Hawkeye, Mockingbird and a few other heroes agreed to the mind wipes of that program. But I will admit while it gave me hope that it kept love alive for Barton and Morse, well I really questioned if this was information that Maria Hill would have had. Additionally, it hinted at a romance between Romanoff and Rogers that felt more like fan fiction from the Marvel Cinematic Universe than something from Marvel 616. I have decided that this is really an alternative universe reveal, not Spencer telling us why Secret Avengers volume two happened in one frame. Seriously kids, keep love alive! While this is three separate tales, each story includes an Avengers like team! So I am figuring that this is going somewhere where it is all connected, because it’s not like Spencer leaves things to change. Well unless you count a secret secret Avengers sitting in a diner looking for a storyline that never happened. Hey, do you remember that time Cannonball and Sunspot went drinking with some A.I.M. guys? They had some good times (yeah I have used that before)! Really Cannonball and Sunspot are the stars of this issue. And their appreciation of A.I.M. continues. Really despite being held hostage on A.I.M. Island, I do not believe they really want to leave. They also get some of the best lines of the entire book. And to top it all off, Sunspot may be in love. Move along M.O.D.O.K. because Sunspot is already picturing what his babies look like. Seriously, with all those spies in the Avengers, Hill keeps sending Cannonball and Sunspot on secret spy missions. Clearly it must be love right! The two also get the best pop culture reference of the book…twice. The best stuff out of the Madripoor storyline is the reveal of S.P.E.A.R.. There have been hints at this Chinese version of S.H.I.E.L.D. in Secret Avengers but I do not believe that we have ever seen them. In Falcon’s story we see their tech, get a rundown on their resources and get part of their mission statement. The big reveal is they have their own version of the Avengers, the Ascendants, so that China can stand up against the bigger threats without the West. But at the moment I am not looking at them as competition and they are trying to sell this fact to Falcon. Will the Avenger stand with the Ascendants? With Euroforce the question is how is Black Knight leading them? He is not European! But the Ebony Blade is! And his experience as an Avenger and European outfit are probably a benefit in being a European hero. Cool, I did not realize that part of Spencer’s Secret Avengers storyline was being somewhat partially continued. And he did make a Mockingbird reference. 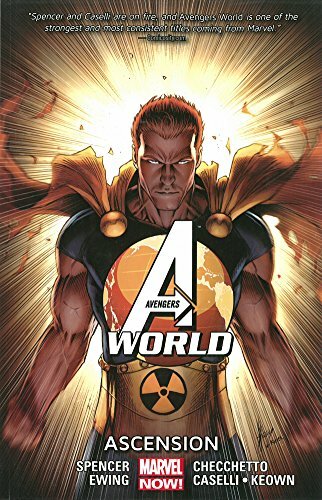 While this may not have been my favorite Avengers volume of all-time, I can see threads I want to keep following. I really enjoyed the S.P.E.A.R. and Cannonball/Sunspot material (these guys need their own title). So I will return for the next collected installment in the Comic Files.